Some years back I had the privilege of visiting the Smithsonian in Washington D. C. for the first time. I was in my early twenties and already smitten with the Civil War, so a tour of the collection at the National Museum of American History held a special thrill. A sight I will never forget is the preserved taxidermy of Union General Phil Sheridan's famous horse, Rienzi, (AKA Winchester) This horse made the famous forty mile ride, carrying Sheridan after the Battle of Cedar Creek down the Shenandoah Valley to rally the flagging Union troops. He served the general in over forty battles, and was even present at the signing of Lee's surrender at Appomattox. His fame was set to poetry and painting, and the famous cavalry horse was immortalized in a tribute to the enduring sacrifice and service of these military equines. 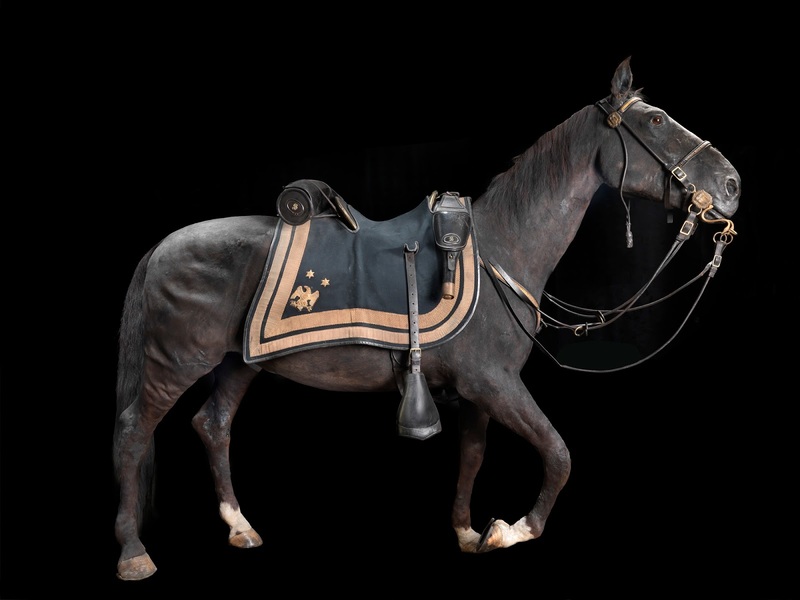 Cavalry--from the French cheval for horse-- is just one example of service that horses provided for the military. Other uses include artillery and pack horses, mule trains, and draft animals--even in dire times serving as food. 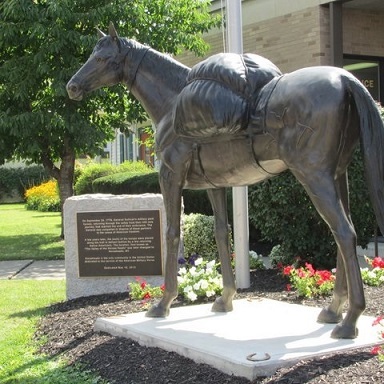 A town close to where I live named Horseheads honors the pack horses of the Revolutionary War who served under General Sullivan. But among war horses, the cavalry mount was the A-lister. Famous, glamorous, most visible, the public hailed the courage of these steeds and celebrated them by name. If I were an artist like you I would draw a true picture of Traveller — representing his fine proportions, muscular figure, deep chest and short back, strong haunches, flat legs, small head, broad forehead, delicate ears, quick eye, small feet, and black mane and tail. Such a picture would inspire a poet, whose genius could then depict his worth and describe his endurance of toil, hunger, thirst, heat, and cold, and the dangers and sufferings through which he passed. He could dilate upon his sagacity and affection and his invariable response to every wish of his rider. He might even imagine his thoughts, through the long night marches and days of battle through which he has passed. General Grant had his Cincinnati, the son of famous racehorse Lexington, and ridden by Abraham Lincoln. 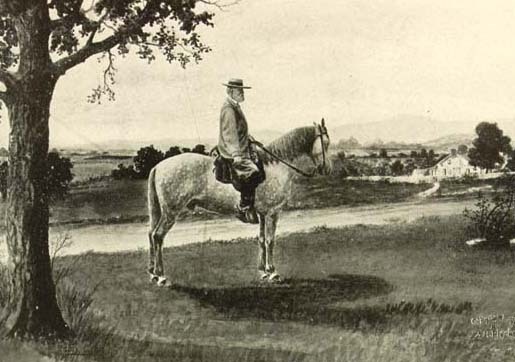 Stonewall Jackson rode a homely, runtish horse named Little Sorrell who was beloved all over the South. General Meade had a horse named Old Baldy, who took a bullet for him five times.General Nathan Bedford Forrest had 39 different horses shot from under him. 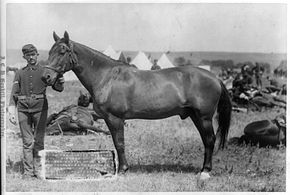 Comanche was one of only four horses to be given full military honors at his funeral. Napoleon Bonaparte had a celebrated stallion named Marengo who carried him through many campaigns, including Waterloo, where the French general was defeated, and the horse was captured and kept by a British officer for the rest of the horse's life. 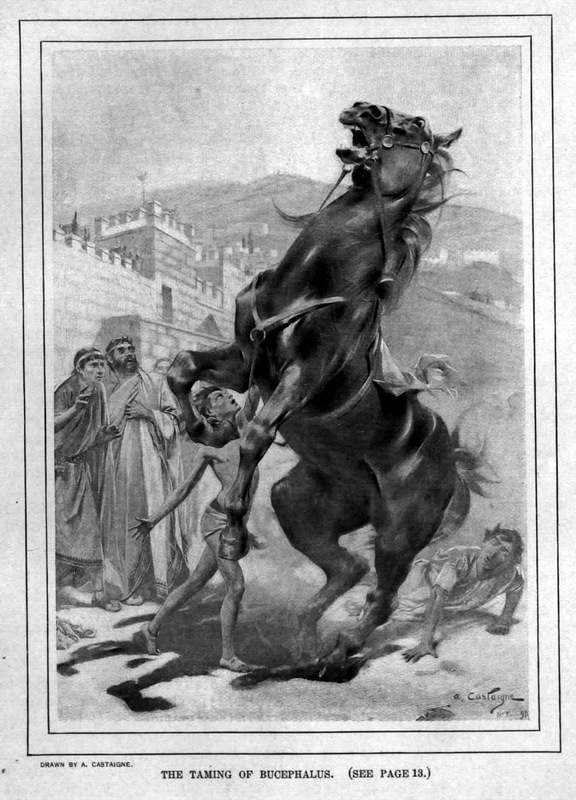 But no telling would be complete without mentioning the mighty Bucephalus. The massive black stallion had been presented to King Phillip of Macedonia as a gift, but no one could manage him, according to legend. At thirteen years old, Prince Alexander observed something no one else had about the horse's seemingly wild behavior--the horse spooked at his own shadow. Alexander boasted he could tame him, and proved it, turning the stallion toward the sun so he would be vexed no more by the shifting dark patterns about him. 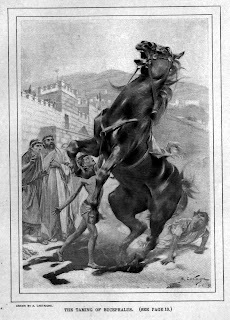 From there, Bucephalus became inseparable to Alexander the Great, carrying him through one battle after another until the pair conquered the entire known world of their time. Do you have a favorite book or movie that depicts a strong bond between hero/heroine and an animal? If so, what? I will be drawing a winner by random.org on Friday. Earn *Bonus entries* if you share this post on FB, Twitter, Pinterest, or other social media sites. Be sure to leave your email addy in comment and tell me how many entries/sites shared. Thanks, Connie! I loved those books, too! I was convinced I’d grow up and marry Alec Ramsey. Lol. Ok, got your entry. Good luck! National Velvet was a favorite of mine as a young girl. This is a fascinating post. I shared on FB and Twitter. Oops - forgot my email lindasmatchett at yahoo dot com. Thank you, Linda. I read National Velvet in 7th grade. Loved it. Thank you for sharing this post. Good luck! The War Horse was a fascinating movie. Thank you for this great post. Caryl, you rock! Thank you for sharing this post. Good luck! I loved War Horse, too. Though I never read Stormy or Misty of Chincoteague, I loved Marguerite Henry’s other books, such as King of the Wind, and Black Gold. Her illustrator Wesley Dennis is the reason I draw and paint to this day! Thanks for entering and sharing on social media. Good luck! Hi, Melanie. I loved Old Yeller, too. I read that the same year as I read The Yearling. I’m a sucker for boys and their pets. Kim, thanks for entering. I guess dependency on animal labor and genuine affection for your animal can be two different things. Some stories show the beautiful bond of trust and love between man and beasts. I hope in this book I’m offering readers will enjoy the bond between the twins and their thoroughbreds Cinder and Nimbus. I had a lot of fun dreaming up these characters. Oh, I forgot to say, thanks for entering. Good luck! I do know through all the wars around the world that involved man and horses that the bound was unbreakable. what a wonderful post. i love your bits of history. i have loved Black Beauty and then War Horse. Thanks, Lori. My childhood would have been a lonely one without these wonderful stories. Loved Black Beauty, too. Thank you for entering. Good luck! Oh I would love to win this book in paperback !!! As you know Historical Fiction is so much my favorite and love your stories Kathleen. Learning something new everyday about history is fun and makes life more meaningful! That was so sweet of you Kathleen... God knew what he was doing when he put us together that Thirsty Thursday !!! It is amazing where he has taken you in writing. I so need to do more myself. I loved Marguerite Henry's books, especially the ones about Chincoteague Island, VA and I still dream about vivisitng there one day! I have shared on Facebook, Twitter and Pinterest. 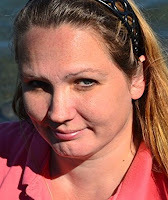 Hi, Betti Thank you for commenting. I never read Misty or Stormy but I love Marguerite Henry as an author. Her illustrator really inspired me to begin painting and drawing. I see someone already mentioned National Velvet. Another good one is Ring of Bright Water about the bond between a man and an otter. The movie was funny and a tearjerker. Interesting post about famous Cavalry horses. Flicker, Old Yeller and Black Beauty are ones I remember from childhood. I love the movie, Dreamer (2005 starring Kurt Russell & Dakota Fanning)! The movie is based on a true story about the bond between a girl and a cast-off race horse, Sonador, who suffered a broken leg. The girl believes the horse can be rehabilitated and race again. Such a GREAT movie!!! Historical fiction is my favorite genre to read! 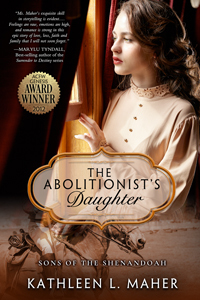 Kathleen, your new book, The Abolitionist's Daughter, sounds so good! Thanks for the chance to win a copy!! I would have to say Black Beauty was a favorite. Plus i love horses. Thank you Diane! You’re the best. I would love to receive the book. I used to live in Horseheads, New York also and would love to learn more history. Black Beauty was a favorite movie is a child and I watched Flicka on TV every Sat. morning. Roy Rogers and Trigger were also favorites. Thanks for a great post. Loved this article a Kathy! Live your writing! Hugs! I've many books but, can't think of a specific one. A book I read many, many years ago. It was called Robin Kane, Mystery of the Blue Pelican by Eileen Hill. It was a mystery but the connection of Robin and Nugget always thrilled me. I still enjoy reading it now even though it is for young teens. That sounds sweet. Thanks for sharing. It is now time to draw a winner on random.org. Drumroll please… And the winner is AGBOSS—Congratulations Alison Boss! I will be contacting you shortly to ask what format you prefer whether print or Kindle. A heartfelt thanks to everyone who came and entered and shared and made it such a fun discussion. Wednesday the 15th there will be another opportunity to win on the mid month madness party so stay tuned!